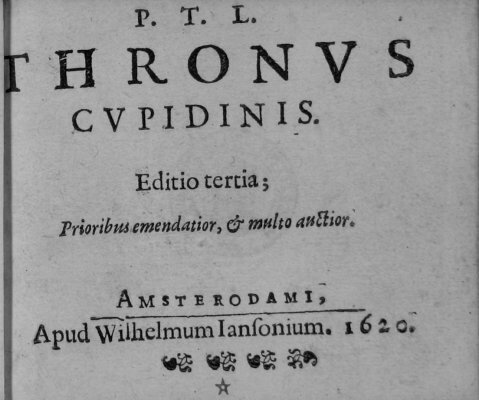 This is the opening page of our digital edition of Thronus cupidinis (1620), written by an unknown author. In this edition you will find an editorial introduction, a concordance, full transcriptions, page facsimiles and indexes. Links to sources and parallels, translations and annotation are being added. Please be aware that three of our editions have a special status. The digital editions of Hooft's Emblemata amatoria, Cats's Sinne- en minnebeelden and Luyken's Duytse lier are based on existing (paper) editions by Karel Porteman, Hans Luijten and Arie Jan Gelderblom a.o. The complete transcription used for our digital edition, can be found under this URL. The XML- and DTD-files can be downloaded after following this link You will need an editor like Notetab to work with these files. © Our work is licensed under a Creative Commons License.